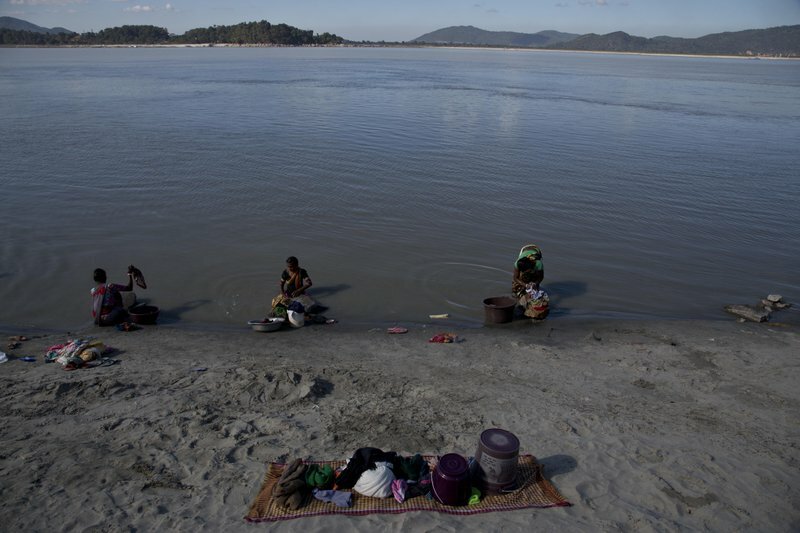 Officials in India’s northeast are complaining that Chinese construction activity on the upper reaches of one of the largest rivers that flows into India are likely turning the waters downstream turbid and unfit for human consumption. 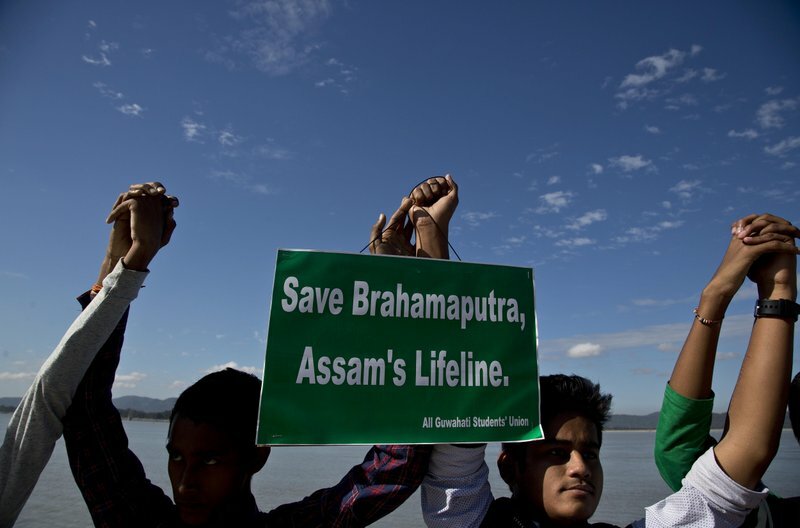 Over the weekend, Sarbananda Sonowal, the chief minister of India’s Assam state, said the Brahmaputra river was contaminated with bacteria and iron, with laboratory tests declaring its waters unfit for human consumption. Sonowal asked that the Indian government take up the matter with Beijing. The Yarlung Tsangbo river originates in the Tibetan Himalayas and enters India as the Siang in far-eastern Arunachal Pradesh state before flowing downstream to Assam as the Brahmaputra. The river finally empties into the Bay of Bengal through Bangladesh, where it is called the Padma. Last week, Pema Khandu, the chief minister of Arunachal Pradesh, which shares a border with China, wrote to Indian Home Minister Rajnath Singh, saying the waters of the Siang river have been “unusually turbid” for the past two months, and sought a federal investigation. Keshab Mahanta, the water resources minister of Assam state, has written to Foreign Minister Sushma Swaraj expressing serious concern about the water quality of the Bhramaputra. Locals in Arunachal Pradesh suspect the Siang is contaminated because of Chinese construction activities in the upper reaches of the river, including possible attempts to divert the river to feed its arid northern areas. “The Chinese may seek to deny, but we suspect there is massive tunnel building activities to divert the Yarlung Tsangbo to Xinjiang province, particularly the Taklamakan desert region,” Lungkang Ering, president of the All Bogong Students’ Union in the border district of East Sing, said in a letter to Indian Prime Minister Narendra Modi. “China is constructing several dams on the Yarlung Tsangpo. One big dam, the Zangmo dam, is already operational and about three to four other dams are under various stages of construction. The Zangmo dam is located just 3-4 kilometers (2-3 miles) from the Indian border and is 116 meters (380 feet) high,” according to Nayan Sharma, a leading Indian hydrologist at the Indian Institute of Technology Roorkee. The Chinese Foreign Ministry said Tuesday that it had never heard of the project mentioned by Indian officials in Assam and Arunachal Pradesh states. In the past, China has denied such accusations without providing details or enunciating its long-term plans for the area. India’s foreign ministry spokesman did not reply to queries about whether New Delhi had raised concerns with Beijing. Sharma said the turbidity in the segments of the river in India could be because of construction debris flowing downstream or because of an earthquake last month near the Great Bend on the Yarlung Tsangpo just as the river enters India, leading to major damage and debris flowing down. “A federal investigation is a must because there is loss of aquatic life in the Siang and the Brahmaputra because of the contamination over the weeks. China is miserly in parting information on the river issues and therefore New Delhi must take up the matter at the highest level with Beijing,” said Arunav Goswami of the Gauhati-based Centre for Development and Peace Studies. 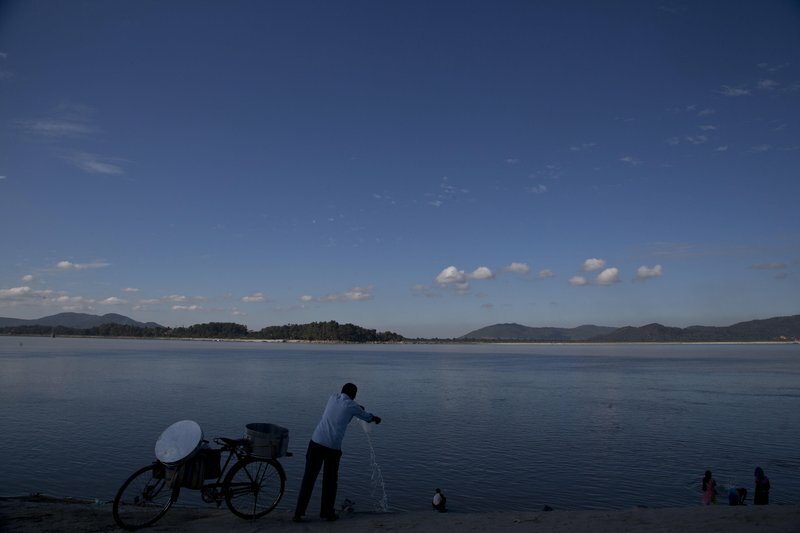 Sharma and other experts say India needs to investigate the causes of the contamination of the river, which has also begun hitting aquatic life on the Siang and Brahmaputra rivers, because China is unlikely to share information with New Delhi. Kameswar Sahani, a fisherman in Arunachal Pradesh, told a local newspaper that dozens of fishermen like him have been forced to stop working on the Siang river. Over the last few months, his catch went down to just 3-4 kilograms (7-9 pounds) from 30-40 kilograms (70-90 pounds) earlier. Sahani also said that customers were balking from purchasing fish from the Siang because of contamination fears. “How will I feed my family?” he asked. 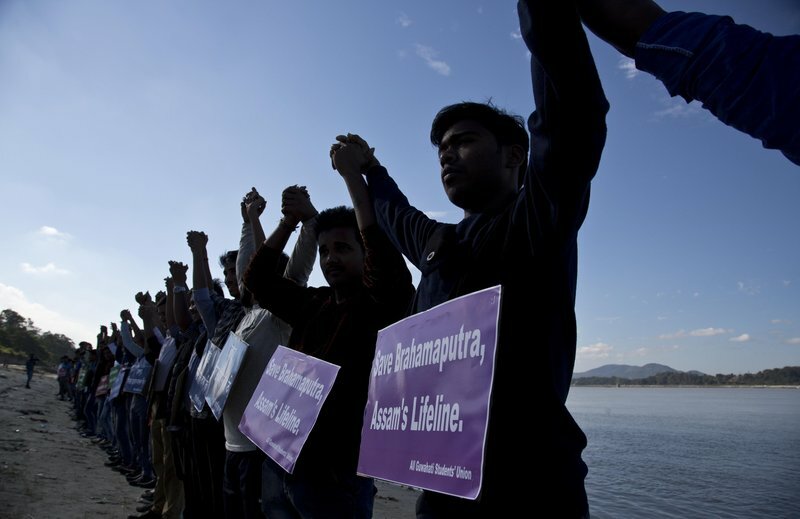 In this Monday, Dec.11, 2017 photo, students from India’s northeastern Assam state hold hands by the Brahmaputra river during a protest against the contamination of the river in Gauhati, India. Officials in India’s northeast are complaining that Chinese construction activity on the upper reaches of one of the largest rivers that flows into India are likely turning the waters downstream turbid and unfit for human consumption. In this Monday, Dec.11, 2017 photo, an Indian fish seller cleans his drum at the river Brahmaputra in Gauhati, India. 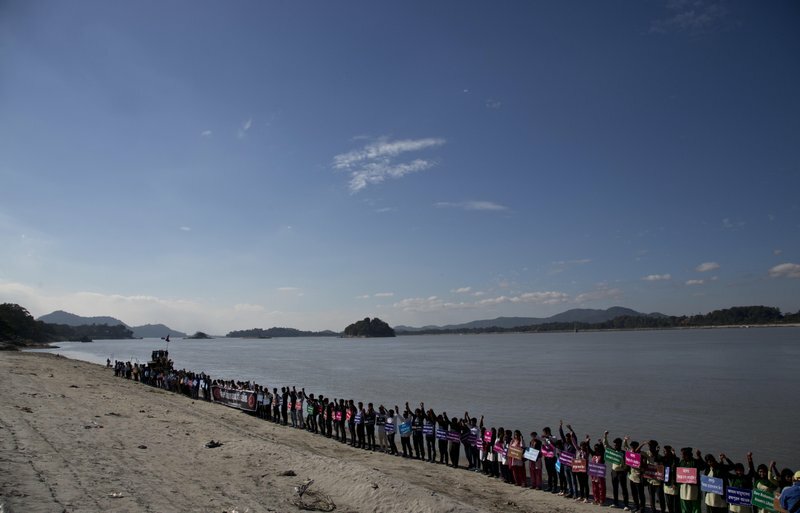 Officials in India’s northeast are complaining that Chinese construction activity on the upper reaches of one of the largest rivers that flows into India are likely turning the waters downstream turbid and unfit for human consumption.